Lost City: Lost City Asks "Who Goes to Sardi's?" 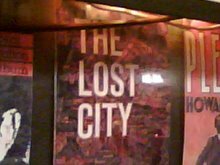 Lost City Asks "Who Goes to Sardi's?" I personally think the way the theatre community ignores Sardi's—it's only culinary connection to Broadway's golden past—is unconscionable and criminal. Why hang out at the sub-par joints-of-the-moment when your cultural legacy awaits smack dab on W. 44th? Because you want better food? Actors don't care about good food. They just want something they can stuff in their mouth. And, moreover, there IS no good food in the Theatre District. No, showfolk just have to follow the bouncing spotlight to the place that will underline the idea that they're still hot, still sought-after, still on top of their game. And Sardi's isn't that anymore. But it's a grand place, anyhow. Few restaurants can boast such a beautiful space, such a colorful atmosphere. While I was there, however, I learned of a sad development. The old wooden booths on the second floor—some of the best of their kind in the city—no longer have phones in them. They were taken out six months ago. The villainous phone company is to blame. They charge businesses extra for keeping phone booths in working order. Such a shame. Sardi's may well be the most undervalued restaurant in town. A time capsule from another era, as well-preserved and redolent of New York history as "21" or Peter Luger, it is nonetheless regularly dismissed as corny, uninspired, even embarrassing. By locals, I mean. Out-of-towners, of course, love it, and make a visit within its warm red walls a requirement of their regular Broadway sallies. In in the dog days of August, you'll see plenty of them most any evening between 6 and 8 PM, alerting waiters they have a show to go to (No! Really? ), and craning their necks to identify at least one or two of the hundreds of largely unrecognizable caricatures of theatre greats that line the walls. Sardi's has been in its current location since 1927 and has been in Sardi family hands for almost all of those years. (The current head of the family is Sean Ricketts, the grandson of Vincent Sardi Jr.) It remains there by the grace of the powerful Shubert Organization, which has long owned the building and leases the space to the restaurant. 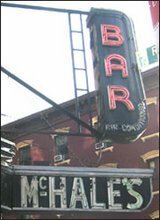 As anyone with even a passing knowledge of New York history knows, the joint was for a number of decades the chosen watering hole and chow house of the Broadway set. (The idea for the Tony Awards was hatched at a table here.) The fickle illuminati of the stage have long since moved on to other social beehives, like nearby Joe Allen and Angus McIndoe. They are fools. For Allen and McIndoe don't have better food—the quality of the kitchen fare has always been a knock against Sardi's—and in terms of mise-en-scène don't even begin to compare. Sardi's large, boxy, grand main room is theatre itself. It has high ceilings, spliced by wooden pillars. Square four-tops, set at a diagonal and surrounded by bentwood chairs, are corralled by a red banquette that all but borders the entire hall. The civilizing effect of a good banquette can not be underestimated. The world looks better from a banquette and people who sit in a banquette look better to the world. They ennoble the seated, framing faces and conferring perfect posture. And Sardi's has some of the best banquettes in town. The set-up is more formal than the tourists are used to, and it makes them quaintly self-conscious as they order their Cokes and Cannelloni au Gratin. The children, wearing the best shirts their parents could force on them, fidget uncomfortably, as if at church, and keep their voices down. They're not enjoying the experience as much as their folks, but they're bound to remember it in 20 years. A few small parties of regulars and New Yorkers can be easily spotted among the throng. They are old, observant, relaxed and imbued with a quiet, somewhat shabby gentility. They linger over their crab cakes and silver coffee pots, and no longer care who the caricatures depict, though they do still occasionally crook a quizzical finger at them. Waiters are in red jackets and black pants, with "Sardi's" stitched in gold thread near the left lapel. They prepare Steak Tartar tableside, shaking the meat in a silver bowl until it comes out a seamless smooth orb. They come from all lands. When they sing happy birthday to a little southern girl with a big yellow ribbon in her hair, a cacophony of accents fills the air. The girl has a kiddie cocktail; Sardi's can still be bothered to make that kind of thing. Adults have water or sodas, perhaps saving money because the restaurant's prices ain't cheap. Are there any theatre people here tonight at all? Famous actors? Moneyed producers? Nope. Doesn't look like it. But who cares? The gentle and appreciative theatre-goers who see their plays are. Labels: sardi's restaurant, who goes there? I love Sardi's. Period. I am ALL about the old New York restaurants. And I have no shame about it. The fact that "Broadway" doesn't go there now...well, screw them. Just as well. The food at Sardi's is still good, too. So, let "Broadway" starve at the trendy mediocre places. They deserve it. The out-of-towners have more money to spend anyway. Next time I'm in the City for dinner, I'll hit Sardi's (since Gino is gone) and then maybe, pick up desert at Rene Pujol. That is a wonderful article. I hope it helps Sardi's a lot! When you think of Sardi's you think of Broadway theatre, but we do not have the new plays and shows that were being done by great writers and producers, we do not have the clubs, where people performed, singing or whatever, we are not the great theater center we once were. Sardi's was part of our past theater world, not this, paint by numbers theater, which is much of what we have these days. I cannot help thinking of Sardi's as, now, belonging to the tourists, just like that whole area. Not that some great stuff is not on and off Broadway. Brooks, I do so love your "Who Goes" series. And I miss LC. 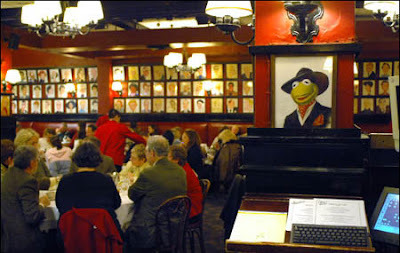 The first time I ever went to NYC my wife and I went to Sardi's and the now lost Tavern on the Green. We had two really wonderful meals and we were treated like regulars at both places. Sardi's has a very fond place in my heart. I agree with Lori, above. "Screw them". I too was a fan of Rene Pujol and had several great meals there but I hear that it closed. Another special place gone. Sardi's is quaint -- and that's a reason to love it. Before or after a play, why not go to Sardi's? Frankie and Johnnie's? Ah. I don't eat steak. The locals are all getting tanked upstairs at the bar! That's where the giant crock of orange cheese is, and the plate of Ritz crackers - the same free bar food that sustained many broke actors over the years. I always go upstairs; you see all kinds of people, the bartenders rock, and history hangs like a classic old perfume. What a terrific post. I thoroughly enjoyed being a fly on the wall and getting a peak into the vivid details and characters that step into Sardi's. Great writing. Would the kiddie cocktail be a Shirley Temple? Growing up, Sardi's in my mind was the classic elite, fancy dining spot for the high brow theater community. It was inaccessible to a girl like me from the 'burbs of Queens, but I always held it in admiration as being a quintessential New York spot. I'll have to go there one day with my family. Thank you!